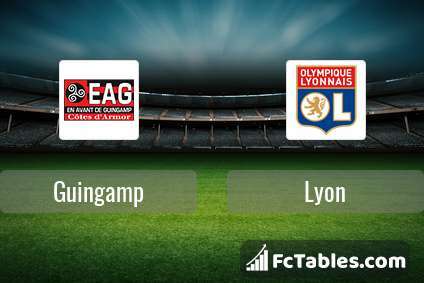 Kick off Guingamp-Lyon in Ligue 1 on today 16:00. Referee in the match will be Mikael Lesage. Team Guingamp is in the releagtion zone of the table. 20 position. Form team looks like this: In the last 5 matches (league + cup) gain 6 points. Guingamp did not win the match from 4 games. From 2 matches at home no lost a match. Leading players Guingamp in Ligue 1 is: Nicolas Benezet 3 goals, Marcus Thuram 3 goals, Nolan Roux 1 goals. Players Nicolas Benezet 1 assists will have to be very well guarded by defenders Lyon, because they have the most assists. Team Lyon is at the top place in the table (4 place). In 5 last matches (league + cup) team gain 8 points. Not lost the match from 3 games. Players Lyon in Ligue 1 with the highest number of goals: Bertrand Traore 4 goals, Houssem Aouar 4 goals, Memphis Depay 3 goals. Most assists in the club have: , Memphis Depay 2 assists. Direct matches: Lyon won more direct matches. Guingamp won 6 matches , Lyon won 11 direct matches, was a 2 draws. In 12 matches the sum of the goals both teams was greater than 2.5 (Over 2.5), and 15 matches teams scored more than 1.5 goals (Over 1.5). In 11 matches the both teams scored a least one goal (Both teams to score).